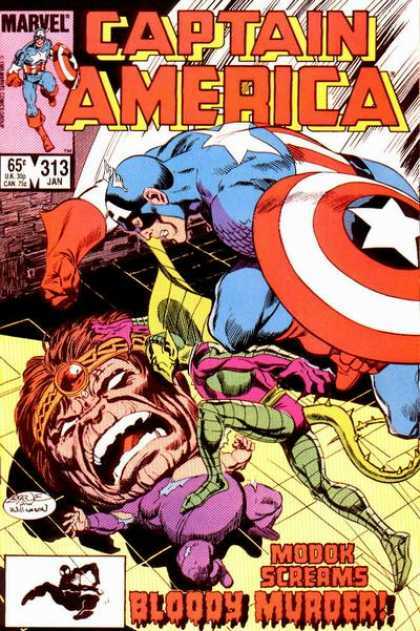 Our submission for this year’s March MODOK Madness, a blog dedicated to the big-headed wonder run by a couple of Dana’s friends. I’d like to think we’ll manage another submission this year, but I’ve been struggling to write anything good lately, MODOK-related or otherwise, so I guess we’ll see what happens. For those of you not familiar with MODOK, he’s a villain from the Marvel Comics universe (the same one with Thor, Iron Man, Spider-Man, etc.). His basic deal is that he volunteered to be mutated by these scientists/terrorists to be smart enough to understand how to use this all-powerful weapon called as the cosmic cube. I don’t remember what the problem with the cosmic cube was that required being super-smart and/or psychic to use it, but the science-terrorists decided it was necessary for whatever reason, hence the psychic monstrosity with the giant head and hover-chair. As is the case with most super-powered biological abominations, MODOK quickly rebelled against his creators and took over their organization. Once he took over, I don’t think he really changed much besides being his own boss, but I admit that my knowledge of MODOK lore is hazy at best. If you want a more accurate rundown, I would head over to Wikipedia and have yourself a little read. I can understand MODOK’s decision. It’s good being your own boss. You get to set your own hours. Get all the nicest donuts. Nobody to hassle you if you decide to have a mid-afternoon nap. Awesome contribution, guys. Supervillain rule #1: Never give up any territory that possesses a Panera Bread. Thanks Brendan, glad you like it. Coming from you, the undisputed master of MODOK submissions, that’s high praise. Good advice about the mundane situations. I’ve had bad and embarrassing writer’s block for the last few weeks, so maybe that will help jar something loose. What does MODOK look like without his hover-chair? That’s a good question Dragon. I actually don’t know if he can come out of it. I feel like he’s a cyborg and he needs the suit to live, but that’s basically pure conjecture on my part. That sounds the most reasonable but I still like to picture him as a giant head stuck on his back flailing his little limbs helplessly. It makes me giggle. I have a comic idea for March MODOK Madness.I can’t draw so I apologize in advance. Expect something in a week.